In this Gillian Darley and I pooled our knowledge of architectural history and decorative arts and combined the two disciplines (an obvious thing to do, but rarely done) to produce a reference book with over 1300 illustrations which showed how motifs and forms were used in different media, and how various ornamental features were key to different styles from the Middle Ages to the mid-20th century. It also included reference to the principle pattern books used by architects, designers and craftsmen. 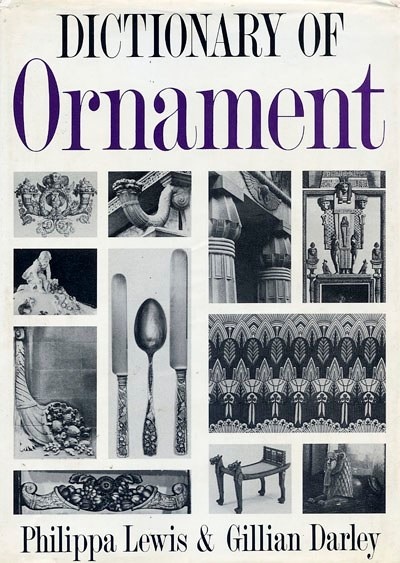 The great Owen Jones, who produced his influential ‘Grammar of Ornament’ in 1856, wrote in his introduction: ‘It would be far beyond the limits of the powers of any individual to attempt to gather together illustrations of the innumerable and ever-varying phases of Ornamental Art. It would be barely possible if undertaken by a Government, and even then it would be too voluminous to be formally useful.’ Well, we had go – and it is still the only book on the subject in print.